Jabberwock: Thoughts on Oye Lucky! Lucky Oye! Thoughts on Oye Lucky! Lucky Oye! Delhi loyalists who follow contemporary Indian writing often complain about the absence of a Great Delhi Novel – a book to rank alongside the many epics that have been written about Bombay (Shantaram, Sacred Games and Maximum City being only a few recent examples). But the Great Delhi Film has been even more elusive. Mumbaikars have access to hundreds of movies that have recorded the development of their city's best-known vistas over the decades – adding up to a historical document in the form of moving pictures – but we Delhiites must make do with blink-and-miss glimpses of our past. Watching Sai Paranjpe's Sparsh recently, I caught myself rewinding and re-rewinding a scene to try and figure out if the Shabana Azmi character lived somewhere near Golf Links. And that shaded lane in the background, on which a solitary Fiat was zipping along like a race-car...could that possibly be the 1980 avatar of Lodi Road? Dibakar Banerjee's delightful Oye Lucky! Lucky Oye! is a Delhi movie that doesn’t much linger on the city’s physical landmarks but captures many vital aspects of its mood and character. At a basic level, this film is about the (improbably) charmed life of Lucky Singh, a Sikh lad from a middle-class West Delhi household, who grows up to become a master thief and gets away with one audacious theft after another – often doing nothing more strenuous than sauntering into a house and sauntering out again with a TV set tucked under his arm. This makes for a lightheartedly amoral story, anchored by a superb Punjabi-rap soundtrack and by that earsplitting old song “Chahiye Thoda Pyaar”, but Oye Lucky! is also a film that understands the spiraling nature of class aspiration and upward mobility. It knows a thing or two about surviving in a dog-eat-dog world where the kindly, “God-fearing family man" who befriends you and encourages his little son to call you “maama” might well have a dagger ready to plunge into your back. Consequently, even the most flip scenes have undercurrents that are threatening, or poignant, or both; this tone is set by an early sequence where the young Lucky and his pals gape at the body of a friend who was killed by local hoodlums, and offhandedly remark that they too could end up with cotton in their nostrils. At times this movie feels like a more cheerful cinematic cousin of Aravind Adiga's The White Tiger, which was about a lower-class man deciding to become a “social entrepreneur”; the scene where Lucky and his friend Bangali buy “classy” (or gaudy, take your pick) clothes to gain access to a hotel discotheque mirrors the passage in The White Tiger where Balram Halvai gets to see the inside of a Gurgaon mall. And the line “Yeh Gentry log angrezi bolte hain par karte hain desi” sums up the showy behaviour of the nouveau riche whom Lucky simultaneously mocks and aspires to be like. 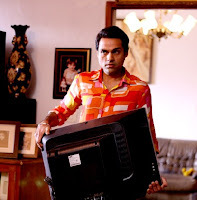 A notable thing about Abhay Deol’s performance as Lucky is that he manages the charismatic Hindi-movie hero act (he's a dead ringer for the young Dharmendra in a couple of scenes) while also allowing us to see that Lucky isn’t to the manor born, so to speak; that a certain effort goes into his facade of coolness, that he isn't always as cocksure as he appears to be. Despite the considerable physical differences between Deol and the equally good Manjot Singh, who plays the younger Lucky in the film's first 20 minutes, it's possible to reconcile the strapping adult with the gawky, reedy-voiced adolescent, and this adds credibility to the film. This definitely isn't a case of the little kid from a 1970s movie turning into an adult Dharmendra or Amitabh mid-leap, and also transitioning into a completely different person in the process. Then there’s Paresh Rawal, brilliantly cast as three separate father figures/Big Daddies to Lucky (one of them is literally his father), placed at various points in his life to stunt his personal growth, each posing a new challenge for him to overcome. 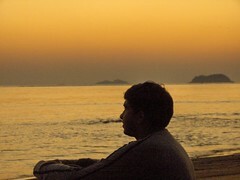 Rawal’s third character, the ingratiating Dr Handa, is very familiar, as is the manner in which his wife (a smooth little performance by Archana Puran Singh) mentions that Lucky closely resembles her US-based brother – “Main to inhe dekh ke emotional ho gayi, bilkul same-to-same Monty hain.” This line doesn’t exist in isolation (which it could well have done, being both funny and authentic in its own right) but paves the way for something else that’s common in certain sections of Indian society: the forced creation of “family” relationships of convenience, which can become a prelude to something more manipulative. I’m not sure whether Oye Lucky! is, properly speaking, a Delhi film or a West Delhi film or even a Punjabi Bagh film (“Tilak Nagar se Rajouri ka chakkar lagaa doonga,” yells Lucky's irate father at one point, and those colonies are the movie’s frames of reference), but it almost doesn't matter. With its fine pen portraits of different character types and its pitch-perfect dialogue – spoken with just the right inflexions – it depicts Delhi's Punjabi sub-culture and the status-hankering of the middle-class like no other film I’ve seen. Anyone who’s lived here for any length of time will find something to relate to – though on a personal note, maybe it helps that I have an uncle named Lucky in west Delhi, as well as distant cousins nicknamed Quiety and Sherry, whose real names have been long forgotten through disuse! totally agree with the part about the movie capturing the essence of delhi for someone even remotely familiar with the city or its people, which was one of the many highlights of the movie. loved dibakar banerjee's debut movie - "khosla ka ghosla" and "oye lucky.." did not disappoint me inspite of my heightened expectations. I personally thought that the brilliant cast of khosla was responsible for such a memorable movie ( highest rated bollywood comedy on IMDB ) , but find it even more interesting that the director managed to get a good one with an entirely different set of actors. Just came across this blog but after reading the first paragraph, I've skipped the review (Since I haven't myself seen it). But judging by the length of the review, I'm sure you're mighty impressed. I think I'll have to watch the DVD. Couldn't agree more with the "review". This was a brilliant film and more importantly it used humour brilliantly to portray something a lot darker. "Yeh hai suchha aadmi," said by the chap who Lucky identifies as the owner of a jewelry set stolen by him is something that I haven't been able to get out of my head. The scene where Lucky promises his younger bro 2 lakhs is he comes to his wedding is another brilliant scene showing Lucky trying hard to buy his way into respectability. Btw, apart from the wah-wahi heaped on Paresh Rawal and Deol, I'd put in a word for the chap who played Bangaali too. You'll probably love the hour long interview with Dibakar on pfc. there are so many delhi-details in this film, that it's probably easy to forget the marriage/party-dancer and the discotheque, her 'vart' and her being a 'vegetable' on mondays!...and when she comes onto Lucky in a big way, later in the film. credit goes to both richa chaddha and the brilliant screenplay. the soundtrack is original. especially the track used for the slow-motion sequence with young Lucky and his crush on the stolen scooter! Perhaps, the film does reflect the essence of delhi. Personally, it’s the only mainstream film in years where one could feel that a character had a relationship with his surroundings. However, I think casting Paresh Rawal in three different roles was unnecessary, if the basic premises were to reflect or carry a subtext of all characters forming a certain growth or obstacles in his path, any other actor would suffice then casting him in the same. It definitely was a fresh movie in the matter of “what” we saw, but it was nothing new or revolutionary in terms of ‘how’ the cinematic idiom was given to us. However, I think casting Paresh Rawal in three different roles was unnecessary, if the basic premises were to reflect or carry a subtext of all characters forming a certain growth or obstacles in his path, any other actor would suffice then casting him in the same. A friend of mine suggested that the triple-role may be to show the relationship Lucky shares with principle authority/father-figures in his life. As someone said on another blog - Delhi doesn't really have an underbelly, it has a potbelly. 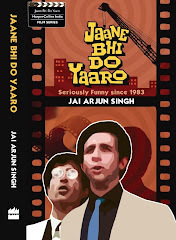 Sai P had a thing for Delhi - Chashme Buddoor was funny and also very Delhi in spirit and of course locale. I liked Khosla ka Ghosla (also set in Delhi) so will definitely see this. In fact my thesis is that Indians make a certain kind of sweet middle class movie very well. Its really a Laxman cartoon converted to a script - bemused, amused and sometimes battered middle class person making it through Indian life. Other Delhi films: Rang de Basanti and Monsoon Wedding? Shiny Tiny Satellite: that's pretty much what I said in the review too. I'd also disagree with there being nothing new in terms of the "how". Among other things, there's a stylised staginess to many scenes in this film, making it seem like a skit in places - the treatment is quite fresh, especially given the sort of film this is (and how easily it might have become a morality play). Shama: "Laxman cartoon converted to a script" - nice. It's interesting how 'Delhi' movies have changed markedly in tone over the years. In recent movies like 'Khosla ka Ghosla' and OLLO, the Punjabi/Jat imprint is so very strong. Whereas, in the Delhi movies of yore such as 'Chashm-e-Buddoor', the Urdu/Muslim influence clearly predominates. I think this trend holds for Bollywood in general. The last fifty years have witnessed the diminishing influence of Urdu/Muslim culture on movie screenplays and the increasing preponderance of Punjabi popular culture. Long time lurker - first time poster (I think). I have to say, I might be teetering over into biased fan-zone as far as Dibakar Ghosh is concerned. I think he can (almost) do no wrong. About Delhi movies, it is true they come few and far between, and apart from the few glimpses of my city in passing in "Dil Se" it has been largely ignored (I think "Monsoon Wedding," and "Rang de Basanti," as mentioned in the comments do their bit, but there needs to be more...) I am yet to be truly "satisfied." I am seeing the trailers of "Dev D" and am simply counting down the days to its release. I personally thought that the brilliant cast of khosla was responsible for such a memorable movie, but find it even more interesting that the director managed to get a good one with an entirely different set of actors. Anon 1: that's a very good point. You don't normally see that happening - usually directors of lower-budget/non-mainstream films tend to have a small band of colleagues they work with repeatedly; a sort of comfort group. Might be interesting to compare the crew lists for both films on IMDB and see how many names are repeated (outside of the cast). Anon 3: yes, and there have been a few other films set in Delhi in recent times - I actually think I have a list somewhere, from the time when Time Out Delhi had asked me to help with a story they were doing about Delhi on the big screen. It All Comes Around: am really looking forward to Dev D too. I take it you've heard the "Emotional Atyachar" track? jabberwock: I din’t get the meaning of treatment per se, wonder what you mean? From what I see, and in my humble opinion, when the montages were used in the most conventional manner and maybe the only difference was that he used ploaried pic instead of live action shoot. The camera moved just like in any other movie would do. The staging was done just like in any other movie would do. So what exactly is the difference in treatment? If the cinematic identity of the movie was just like any other film the movie was not fresh. It was definitely in the representation of the social or economic growth/decay or anything of our society, but nothing to do with the cinematic idiom. Else it would have been a masterpiece, if the surrounding, subject and shot seriously had a relationship through a mise-en-scene or montage. Nor was the movie taking clichés of the cinematic idiom and reinventing film grammar. And the film feeling like a skit, I feel that all the time in most Bollywood film. It does not feel like we watching a film but a skit for good or bad of cinema. Often than not, all of them are stylized beyond belief that I feel I’m watching plays on celluloid. Liked the film because the actors and characters talked naturally. This film showed Delhi like say Mithya showed Mumbai. Shrabonti: now YOU do a post about the film. With the amount of time and energy you've expended in trying to get others to write about it, surely you should be able to do a review of your own. Good way to revive a neglected blog too! Nitesh: like I said, we disagree. But I'm curious about the "reinventing film grammar" and "revolutionising the cinematic idiom" - are those really the expectations you have of a movie before you can give it your approval? And can you give me examples of recent films that have done these things, so I can have a clearer sense of what you mean? Jabberwock: As a cinephile its true these are my expectation. Not that I expect DB to be Ray. But I do have certain expectation from our filmmaker those in terms of their relationship of cinematic identity. And true, if they don’t show any progress it does not go well with me ‘cinematically’. That is as important as the subordinate elements that make up cinema (acting or narrative). Recent, examples, well haven’t seen any mainstream films offering something fresh in terms of cinematic properties. But yeah, Gulabi Talkies, Naalu Pennungal, or few foreign films I saw here ‘The Secret of the Grain’, Tokyo Sonata or recent offering of Buddadeb Dasgupta that I saw- Uttara. Yes... and it is brilliant, the manner in which the band-baja song morphs into something so edgy, all in one swoop of song. I heard it before knowing anything and it left an impression which was only backed up by the incredibly nifty trailer - it starts cleanly enough and as the tailer progresses it stumbles onto a collage of image shards while the song sidesteps into different territory in the background. If the movie is as well done as the trailer, we have a treat in store. Jabberwock: "I'm not suggesting that it was necessary to cast Rawal in all three roles, just that the decision, once made, was very well-executed and in my view strengthened the film thematically"
i'd have to say i felt differently about that. i loved the movie, felt it was as authentically striving lower-middle Delhi as Monsoon Wedding was upper-middle delhi. but the third avatar of paresh rawal let things down a little. Paresh II and III were both recognisable as paresh rawal playing a role, whereas the first one was a masterpiece of both make-up and character acting. i really feel the director should either have stopped at two (or invented an equally distinct third chrarter). especially in a movie like this, it was a sore point - the only time in the movie when the audience was asked to accept things that normal logic would tell them not to. Good lord... I meant Dibakar Banerjee, of course. There goes my groupie claim. Have to agree. But Paresh Rawal's triple role was a let-down (brilliant though he may have been in all three). What no one else seems to have commented on is Abhay Deol's understated performance. I felt sad at the end for Lucky (not that I usually empathize with thieves). But people like Mrs Handa (Archana Puran Singh) do exist -- and there are too many of them in New Delhi. Can't say what I like more - your blog posts or the informed passionate comments they generate. In recent films even "Sunday" was based in Delhi - but what a disaster of a movie! When you say "emotional atyachar", you really mean "emosional atyachar" don't you? Nice piece Jai. I found the movie to be absolutely stunning in its ability to hold your attention . There were brilliant undercurrents of a class divide shown in the film . The lingo was typically Delhiwallah with dialogues like "Bhai Nahi hai Kya" depicting the very nature of some Delhiites to suddenly become your Kith and Kin. Write about Singh is Kinng, a phillum for real men, Punju or otherwise. Thanks for this post. I was waiting to read your views on this film. A very incisive review and an awesome read, as always. Thanks. Anurag: very good observation, that. Of course, the Shiney character comes to a much darker end! Manorama Six Feet Under had some reference of Jaipur. Nice post, Jai. I really liked this movie as well. One scene which stood out for me was where Abhay is sleeping in the car and is woken up by the girl. She brings him tea and he playfully asks for parathas. I thought that was very well done! Abhay Deol has quietly built up a fairly impressive roster of movies now. On movies on/in Delhi, have you seen Dil Dosti etc? Thought that was an interesting movie - worked in parts and not at all in others. But it was definitely quirky and very Dilli. There is a great Delhi movie: The Householder - the first Merchant Ivory film, shot by Subrata Mitra, edited by Satyajit Ray, music by Ustad Ali Akbar Khan, starring Shashi Kapoor and Leela Naidu. Beautifully shot, full of fine Delhi images, and very, very funny. Arguably one of the great films of all time. There is also a Hindi version of the film - but never seen it. Lucky Oye was a 'deep' film. The best part is one goes to watch this film to have fun, but comes out feeling that this is a piece of art! All my memories of Delhi were refreshed again. JW, your very positive review made me watch OLLO (sounds like ullu) & I loved it. Of course, I had heard many good things about Khosla, so I wasn't surprised as to how good this was. You captured the good stuff about the movie very well. The things that made its depitction of Delhi very real to me were: (1) the luridly colored winter clothes; (2) the banners, festoons & billboards covering the skyline at the colony where Lucky grew up; (3) the Delhi pronunciations (Marutti, calawni etc.) & (4) the guy who appears a couple of times asking 'yeh gaadi yahaan kisne park kiya' (once outside the restaurant where young Lucky takes the girl to & the second time in front of another restaurant where he had taken his latest girlfriend - in fact you can see in the background that the situation has deteriorated into a fistfight which Lucky in the foreground completely ignores, & is slightly out of focus). Very sharply observed. In fact I was reminded of Patricia Highsmith's Ripley novels a few times, about another amoral social climbing. sociopath. People from Delhi are mostly A-holes. If you are looking for a reason there are very few movies about the place. It will take many many years to unfold the mysteries and small details behind each scene. There is a single shot of lucky's elder brother in the childhood part where he is studying, and then he is later shown as a bank employee. Even the glasses are similar style. The director has thought of each scene as how it might have happened in reality. I have no idea about the background of director, but i can strongly claim that he must have lived in west delhi at some point of time. There isn't even a single movie based on this part of delhi which i can remember, and it has a unique cultural and socio-economic and linguistic blend.Look at the scene where lucky enters the teenage girl room to steal music system, it is enough to appreciate the depth with which this movie has been made. How about "Massom" as Delhi movie? I love the "Puraana Kila" dialog. Did you notice the tune lucky was humming when he was trying to steal a Mercedes the very first time from a wedding I guess. "jab main Chhota bachcha tha..." the ad jingle. Of course just one of the many things you notice on multiple viewings. Also this is a brilliant blog and reading everything on it is what keeps me occupied these days including the brilliant JBDY book I just bought and read in a single sitting. I just saw Oye Lucky yesterday, and found it funny, deep and insightful all at once. I agree with your observations on the film. One of the most chilling scenes in the film is when the irate rich guy realises his home has been robbed and he takes his gun out to shoot his dog. That scene is haunting me. Wonder if it struck you too!